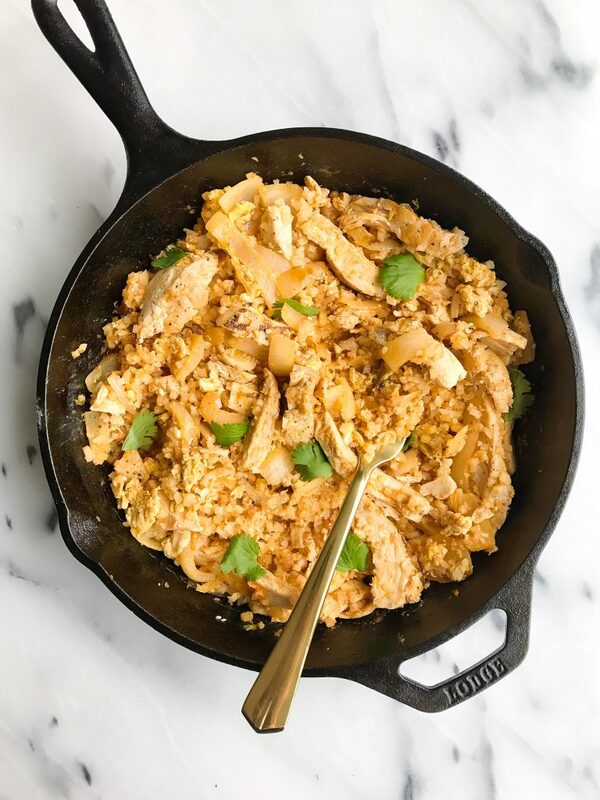 Buffalo Chicken Cauliflower Fried Rice made with simple ingredients for an easy Whole30 recipe! Since it has been a few months since J completed Whole30, for the most part he went back to his “normal” eating habits. He has always had a balanced perspective on food and diet so it’s not like he went back to chicken fingers and mozzarella sticks daily. But he did start having bread, oats and rice more. AKA more grains. I am likely the culprit of this since sometimes it is just easier to make a tuna sandwich for him for lunch and overnight oats for breakfast. Recently he has been asking for some more Whole30-ish meals so we are back on the chia pudding, smoothie and cauliflower rice game. I know smoothies aren’t Whole30 but we use all approved foods. Basically Jord prefers a very paleo-ish diet without the title but pizza and beer on weeks. 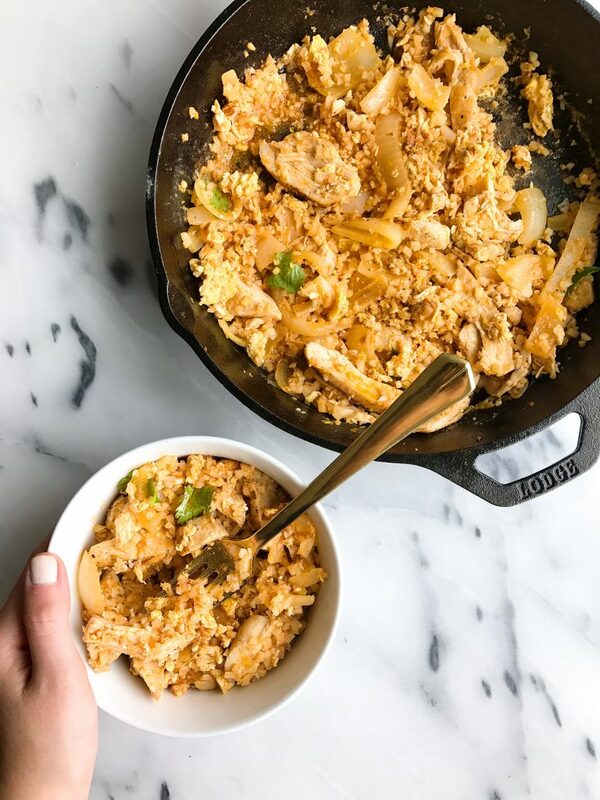 This Buffalo Chicken Cauliflower Fried Rice was such a hit for dinner. And the best part? It takes less than 10 minutes to make it since I cheated and bought already cooked chicken from Whole Foods (no shame). Jord is a devoted Tessemae’s Buffalo Sauce guy too. We use mild or hot and honestly I fully support him drowning everything in buffalo sauce since theirs made with the best ingredients. As you can see a ton of my Tessemae’s recipes are buffalo themed. We should probably branch out a bit soon 😉 But you cannot go wrong with any Tessemae’s dressing. I have a new recipe coming in June with a new dressing they just launched and it is GOOD! Remove from heat and add cilantro and avocado on top and enjoy! This sounds fantastic! I have some cauli rice in the fridge waiting to be used up! It’s amazing how the Whole 30 changed how Jord likes to eat, and I love how you are such a kind friend and wife that loves to do things that he loves to eat. This buffalo chicken dish looks delicious. this looks awesome. need to try. Looks amaaazing!! I can’t wait to eat this tomorrow!